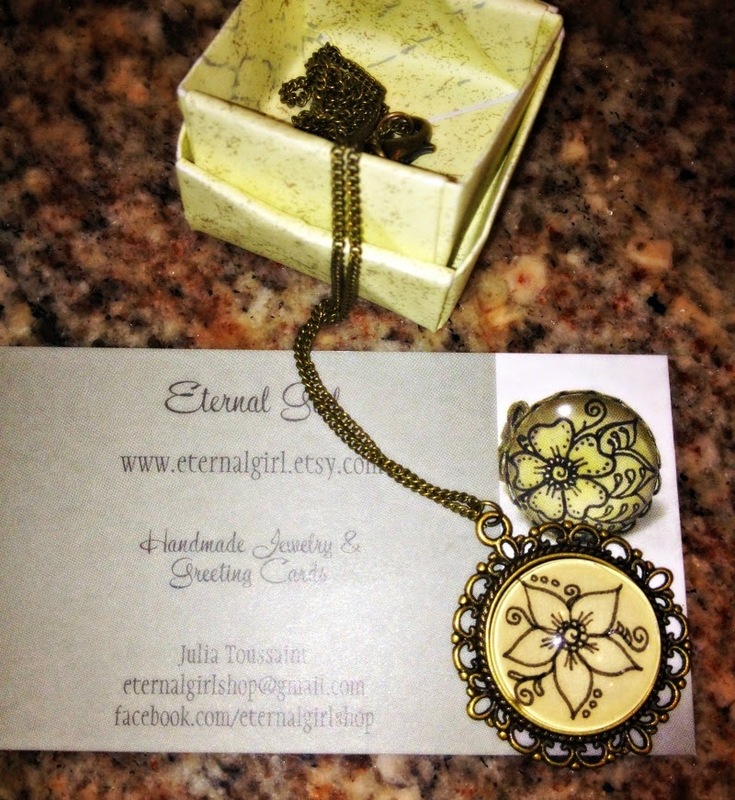 Everything for Ana: Review : Beautiful Handmade Eternalgirl Necklace! Review : Beautiful Handmade Eternalgirl Necklace! I love handmade jewelry. And I love Etsy. So when amazing creator Julia of Eternalgirl originally contacted me to review one of her beautiful necklaces, I was so happy to collaborate. 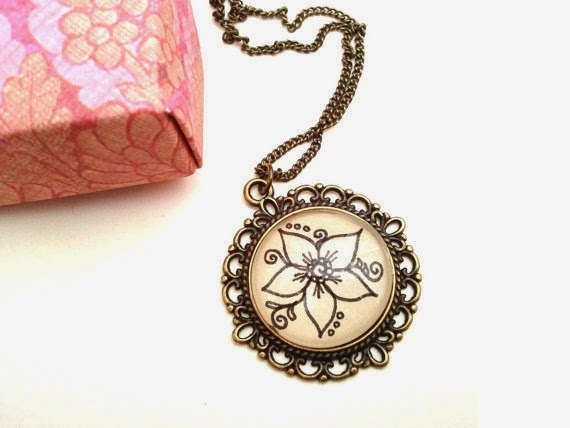 I chose to review the White Orchid Hand Drawn Necklace found HERE and seen above and below! "This hand-drawn, pendant necklace displays a henna inspired, White Orchid. In henna tradition, flowers represent joy and happiness. The image is secured in an antique styled, bronze pendant with a round glass covering. The necklace is made with a bronze metal chain. The last photo shows the length options, respectively. This item is made to order, so yours may slightly vary from what is shown. Chain Lengths: 18" -or- 24"
And a little bit of background on Julia and her brand, Eternalgirl from her Etsy page (I am nosy, so I always like to know how and why creative people make the art that they do), especially since that is not where my talents lie. "Eternal girl" is the female version of a term used in mythology to describe a child-like being craving boundless freedom. I associate my artwork with the undying need to reach out and extend my limitations through love and life. I've always loved to draw ever since I was little. My inspirations comes from Henna & Mehndi art, derived from middle eastern cultures. I was drawing a lot of henna inspired designs during the time I began making jewelry, and my creations have been evolving ever since. I started making jewelry a few years ago, in 2011. I ordered some necklace supplies and began experimenting. After about a year of making necklaces as gifts, my friends encouraged me to sell them online. My artwork gives me a chance to connect with individuals I wouldn't normally interact with everyday. I love creating and keeping my mind focused through jewelry making. I keep in mind that with each piece I work on, someone will own, appreciate, and take care of the jewelry. Review: Premium Garlic Press From Orblue!